K465 "Dissonance" and K499 "Hoffmeister." 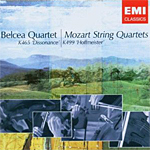 Belcea Quartet. EMI 0946 3 44455 2. I could listen to this stuff all day. In fact, I have. Mostly, though, I remember listening to light, Mozartian music almost every day after work for almost forty years until I retired from teaching. I would look forward to that hour or so after I got home (and before my wife returned from her job) as a time of utter relaxation and contentment, a momentary world apart. The Belcea Quartet's recording of two of Mozart's best-loved chamber works fits right into my new schedule, even if I now have any and all parts of the day to listen to it. The first of the two works on the disc, K465, the "Dissonance" Quartet (1785), acquired its name because of the nature of its slow introduction, not because of any cacophonous or inharmonious qualities. My Random House Unabridged Dictionary defines this kind of "dissonance" best as "a combination of tones conventionally accepted as being in a state of unrest and needing completion." In other words, we're waiting for the real joy of Mozart to kick in. When it does, which is within a few minutes, the piece is almost as cheery and delightful as the even more tuneful K499 "Hoffmeister" Quartet (1786) that follows it, so named more simply because the composer and publisher Franz Anton Hoffmeister first printed it up. The booklet note says that the Alban Berg Quartet, among others, coached the young members of the Belcea Quartet, so I thought it appropriate to play the Alban Berg group's rendition of K465 on Teldec for comparison. The performances are remarkably alike, aside from the matter of repeats. Both ensembles take the work at moderate tempos, never too fast or awkward, never too broadly expansive; and the slow movement of K465 is equally lovely and enchanting in both recordings. The biggest differences are in matters of dynamics, where the Belcea players prefer stronger contrasts, and in the character of the recording, where the EMI disc sounds marginally smoother and fuller than the brighter Teldec disc. In any case, it's wonderful music, wonderfully played.